Atlanta Hawks: I think that these are way better than their red uniforms, way more subtle and less in your face. The gold and the feathers down the side are a nice touch, but they left a lot to be desired. Boston Celtics: BORING. They just added the gold trim down the side and around the letters and numbers. For a city with a great sports history, they could not have done less to respect it. Brooklyn Nets: These are absolutely dope. Whoever designed these needs a huge bonus and to be honored by the hip-hop and basketball communities for honoring Biggie in an appropriate fashion. Charlotte Hornets: They’re fine but really nothing more than that. All black is cool, but I don’t like their color scheme. I still don’t get why a team called the Hornets isn’t yellow and black like actual hornets. Chicago Bulls: I’m a big fan of these uniforms. The color combo with the blue, red, and black is sick and they actually pay homage to the city with the stars from the city’s flag on the chest. I would buy one of these if I didn’t dislike the Bulls. Cleveland Cavaliers: I do not like these jerseys. While they are bringing it back to the jerseys they wore in ’94, they are just too blocky for me. Yes, they have the wave on there for Lake Erie, but that just cuts the jersey in half. Dallas Mavericks: Dallas’ city uniforms last year were terrible and that would make you think that they would work hard to make them better this year, right? Wrong. They are still gross. Black, blue, and light blue isn’t exciting and the logo on it stinks. Denver Nuggets: Oh boy, are these clean. They brought the rainbow back and it looks awesome with the city and the mountains outlined in it. I would wear the heck out of one of these jerseys if I had the money to pay for one. Detroit Pistons: T-U-F-F TUFF. I don’t know if those are racing stripes, a highway, or tire tracks but no matter what they are dope. They shout out the city’s history with car factories and they do it in a way that is nice to look at and also kind of scary to play against. Golden State Warriors: I don’t know if it’s because I hate the Warriors but I do not like these jerseys. There is too much going on and it’s distracting. I like the idea that they were going for with the large Chinese population in the Bay Area, but they need to make it more simple. Houston Rockets: These were well designed, to say the least. The Rockets are leaning into their large Chinese fanbase and they did it in a great way. Their city uniforms last year were similar, but they added so much subtle detail that adds to the overall look of the uniforms. Indiana Pacers: Burn these as soon as you possibly can. They are GROSS. They went for the nod to the city’s history with racing, but the gray is awful. There isn’t a single part of the uniform that I like. LA Clippers: There’s good and bad to the Clippers’ city uniforms. They are shouting out the 1984 Olympics that were hosted by L.A. and all the parts referencing that are dope. The bad is the numbers. They just look jarring against the “LA” on the front. Los Angeles Lakers: Apparently these were designed by Magic Johnson and were meant to honor him, but pinstripes on a basketball jersey? It just doesn’t work. Get rid of the pinstripes and maybe there is something there, but regardless these just aren’t great to look at. Memphis Grizzlies: Nope, no, nah, no thanks. DISGUSTING. These fall into the same category as the Pacers and it is because of the gray base. STOP USING GRAY. IT DOESN’T WORK. Everything about these uniforms is boring and just plain ugly. Miami Heat: Inject these uniforms straight into my veins. These jerseys are absolutely awesome and should be their regular uniforms. The Miami Vice shoutout works so well against the black background and makes for an incredible uniform. Milwaukee Bucks: These might be one of the most interesting uniforms to look at in the NBA. They have that weird geometrical pattern that pays tribute to the Mecca and the team’s glory days. These work well and accomplish what they were set out to accomplish. Minnesota Timberwolves: These got a lot of praise when they first came out, but they could be a lot better. I like the team paying homage to the late, Minnesota native, Prince. However, considering Prince’s “out there” style, they could have done a lot more. They took a great idea and underperformed with it. New Orleans Pelicans: These are the best uniforms that any New Orleans basketball team has had in a long time. This is because they actually show the city’s vibrant culture. Everyone knows New Orleans as Mardi Gras and Bourbon Street and these uniforms show that. 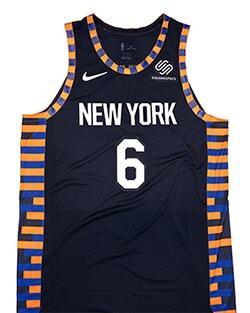 New York Knicks: If you just look at the front of these uniforms then they are wildly boring, but the sides have striping in the pattern of the New York skyline and it is dope. I would have liked them to keep the firefighter logo from last year’s city uniforms, but these are still pretty cool. Oklahoma City Thunder: The Thunder’s primary uniforms have always been rather boring so I wasn’t expecting much out of their city uniforms, but they delivered above and beyond my expectations. The teal background and the shoutout to the Native American history in the area make this one of the best city uniforms in the NBA. Orlando Magic: It’s a no from me, dog. These just aren’t really interesting overall. I guess the stars or whatever they are on the side are kind of interesting, but the rest is just black and white and doesn’t have enough redeeming features to make this a cool uniform. Philadelphia 76ers: I can’t believe I have to say this again, but NO GRAY! These might be the worst of the city uniforms. Apparently, they were inspired by Rocky, but come on these just are bad. I don’t even know what else to say other than, please stop using gray. Please. Phoenix Suns: Gee golly these are boring. They could not have put less work into these. I guess they are appealing to their Spanish fanbase which is cool, but at least put some effort into it. Portland Trail Blazers: The point of the city uniforms is to do something interesting and different. The Trail Blazers chose not to do this and went simplistic. They are pretty cool, but they don’t go out of the box at all. Sacramento Kings: Sactown? Really? I mean whose idea was it to put “SACTOWN” on the front? The colors on it are pretty interesting, but Sactown is just hilarious. Overall, they are cool uniforms and they get bonus points for being funny. San Antonio Spurs: The camo is certainly an interesting look, not sure it’s a good look though. Obviously, there is a lot going on with these uniforms and it is super distracting. On top of that, they did not change these from last year and that takes points away. Toronto Raptors: This is the second year in a row that the Raptors have done a collaboration with OVO and it is basically the same uniform, but it has a white background instead of a black one. Overall, ehh fine. Utah Jazz: Another team that chose not to upgrade their city uniforms from last year, however, I really like these uniforms. They are a cool departure from their normal colors and it’s a nice reference to Red Rock in Southern Utah. 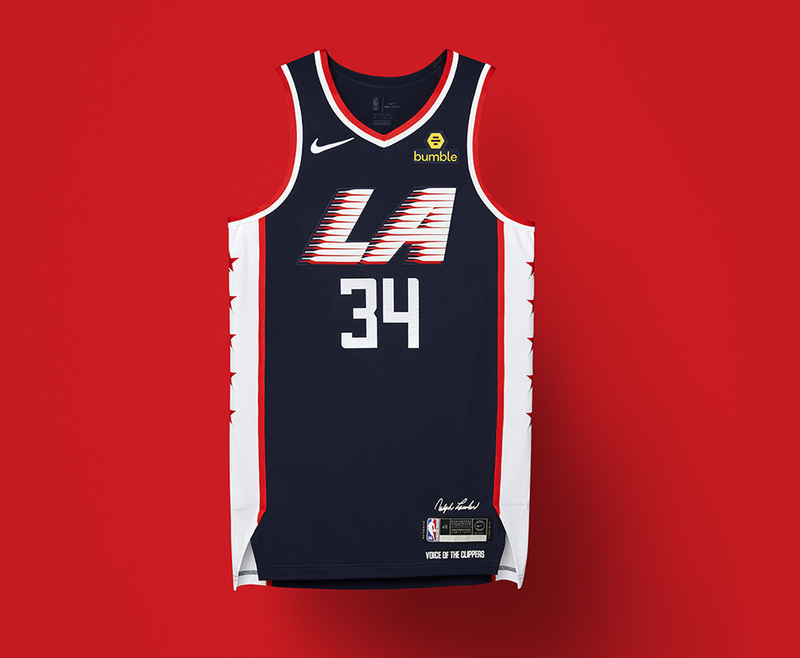 Washington Wizards: I really like how the Wizards moved away from their red, white, and blue colors to the simple black and white. They paid homage to our country’s capital and made the words on the front pop with that sharp contrast. Pretty slick unis.